In a Saturday-evening article in the Milwaukee Journal Sentinel, Brewers minor leaguer David Denson publicly came out as gay, becoming the second active openly gay player in baseball, along with Sonoma Stompers pitcher Sean Conroy,1 and the first active openly gay player in the history of affiliated baseball. Whenever an LGBT person breaks new ground in sports, we hear those two questions, often verbatim, and often over and over, like a drum loop playing on repeat behind the actual discourse. Mercifully, Tom Haudricourt’s Journal Sentinel story does not feature a comments section, but ESPN’s story does, and you can see those two questions there; and in the replies to Haudricourt’s first tweet about the story; and in the replies to the Brewers’ tweet that included Doug Melvin’s statement of support. For some people, saying that Denson’s coming out isn’t a big story is a polite way of imploring him to go back into the closet — that it’s OK to be gay as long as he’s not gay in public. If those people had their way, they’d call Denson a horrible name and implore the Brewers to cut him. That they’ve learned to code their prejudice even a little shows that they know their position is a losing battle. But I’m sure there are others who ask those questions in good faith: If all sexual orientations and gender identities are morally equal, why should we care about Denson’s? He’s the no. 27 prospect in one of the game’s worst farm systems, a 20-year-old minor league first baseman who’s struggled to hit in the very low minors. 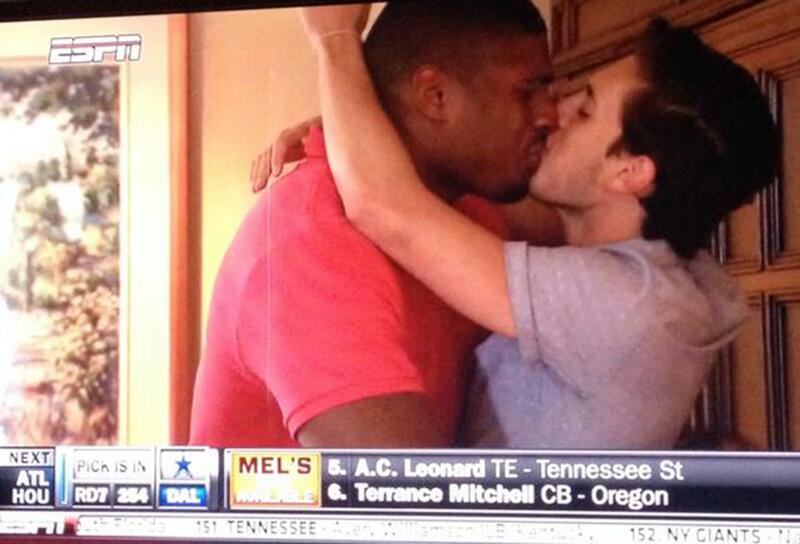 The first openly gay player at the major league level will come one day, but I doubt it will be Denson. But this is still news, and we should still care, and there are three reasons why. First: Sports are a political phenomenon. They have labor battles, they feature pro-military demonstrations, they often take place in publicly funded arenas, and, at the professional level, they espouse a particular brand of capitalism. LGBT rights are a political issue. LGBT people aren’t protected by hate crime legislation in 15 states. Private-sector LGBT workers aren’t protected by antidiscrimination laws in 28 states. The entry of an openly gay man into this atmosphere is, on its face, a political statement. Say what you like — and people will — but this is newsworthy on its face. Second: Haudricourt led his story with an anecdote about Denson rebuking a teammate for carelessly using an anti-gay slur, “Because you never know.” Some people’s prejudice is active — a real, conscious hatred of people who are different. But for others, it’s careless. Often, it’s because those differences are a far-off phenomenon in their lives: They don’t know any LGBT people, or, more accurately, they don’t think they do, so they don’t give it much thought. When they realize that their casual homophobia is hurting someone they love, however, everything changes. That’s the story Denson tells about his father, and it’s a powerful call to exhibit a little empathy. But the third reason is my favorite: I’d bet my immortal soul, or what’s left of it, that almost everyone asking why this is news is straight. I’d bet that most are white, and that considerably more than half are men. Almost all of the people who shape sports and their surrounding culture — and culture at large in this country — are straight, cisgender men. I might not have the power to shape culture, but I’m white, straight, male, and was brought up in a Christian household. I imagine many of you are too. Most of us played baseball by default as children, and even if we didn’t make it to the big leagues, we could look all over the culture of the sport — on the field, in the owner’s box, in the broadcast booth — and see people like us. People like us put on the game for people like us to enjoy, and so it never for a second occurred to us that we might not be welcome. Now imagine not being white, straight, and male, and being interested in the game not because it fell into your lap, but for its own sake. Imagine looking into this culture that you’re interested in and not seeing anyone around who’s like you. Would you feel welcome? We keep asking whether the American sports world is ready for an openly gay pro athlete, even after Jason Collins played 22 games in the NBA after coming out. We all saw the polite applause Michael Sam got when he came out and was drafted into the NFL, right before he was taken out behind the practice field and his career was buried in a shallow grave, under a hill of equally polite cowardice. After Sam came out, his draft stock fell through the floor, and he was relegated to the CFL after receiving much less of an opportunity to stick in the NFL than a straight player with his résumé could have expected; just days ago, Sam announced he’s stepping away from the game amid mental health concerns. If Sam’s experience is any indication of where the culture is, we’re not as ready as we think for an openly gay pro athlete, but maybe it’s time to stop asking whether the culture’s ready, because the answer to that question couldn’t possibly matter less. Asking whether we’re ready for an openly gay pro ballplayer places the potential hurt feelings of the hostile fan above the well-being and dignity of the closeted athlete. You know who is ready for an openly gay pro athlete? A gay kid who’s on the fence about baseball because he doesn’t see anyone like him playing or talking about the game. We know this because we’ve already seen how Melissa Mayeux, Sarah Hudek, Eri Yoshida, and Mo’ne Davis are making that point for women. Seeing a gay player in pro baseball could open up the sport to who knows how many potential fans and players who’d never before acknowledged the possibility that they’d be welcome in the game. A lot of people roll their eyes at the idea of privilege, but this is exactly how it works. The people who ask why this is news have never had to hide who they are for fear of others thinking less of them, because what they are is considered the cultural default. If you look down at the field, or in the program, and don’t see anyone like you, that doesn’t mean you’re automatically unwelcome, or that you have to assimilate to something other than what’s natural for you, but it’s hard to feel like you really belong. Or so I’m told, because having privilege means I don’t know what that feels like firsthand. And if you don’t get why Denson coming out is big news, it might be worth taking a step outside your own experience for a moment to consider what it’s like for those who do. Denson cited former MLB outfielder Billy Bean, now the league’s ambassador for inclusion, as an inspiration and a valuable resource while he was coming out to the public. If Denson himself didn’t have a fellow gay ballplayer2 to look up to — proof that someone like him could exist within the game, proof that someone else knew exactly what he was going through — maybe none of this happens. Denson went from being someone none of us had heard of to opening himself up to unspeakable vitriol and curiously aggressive apathy from people he’ll never meet, all because he wants to hit dingers while having the freedom to be himself in public. And you should care, because having a gay player in pro baseball allows another set of people to be represented in this venerated cultural institution. It helps the thousands, if not millions, of gay fans who want to turn on the TV and see someone like them playing baseball, and the next generation of gay athletes who might be emboldened to live more openly by Denson’s example. This is news because it’s a story that, by being shared, makes people’s lives better — thousands of them, across the country, by different degrees and in different ways — and supporting it costs us nothing. If all you have to say to that is “Who cares?” you’re not asking a question out of apathy. You’re making a powerful statement. The Stompers are an independent league team in California. In the interest of full disclosure, Grantland staff writer Ben Lindbergh is the Stompers’ director of baseball operations. Bean, who retired in 1995 after playing for the Tigers, Dodgers, and Padres, came out in a 1999 newspaper article.